"The Secret to Student Morale"
Photograph of a UND Hockey game student section. 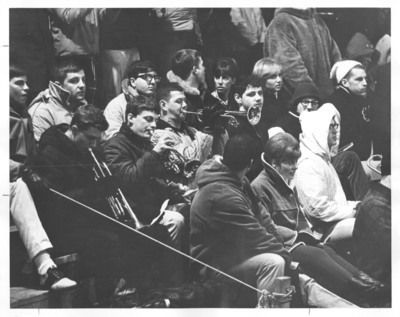 "Despite the extreme cold weather which came from each hockey game, student morale was boosted with music." This photograph can also be found in the 1966 Dacotah Annual, page 84.